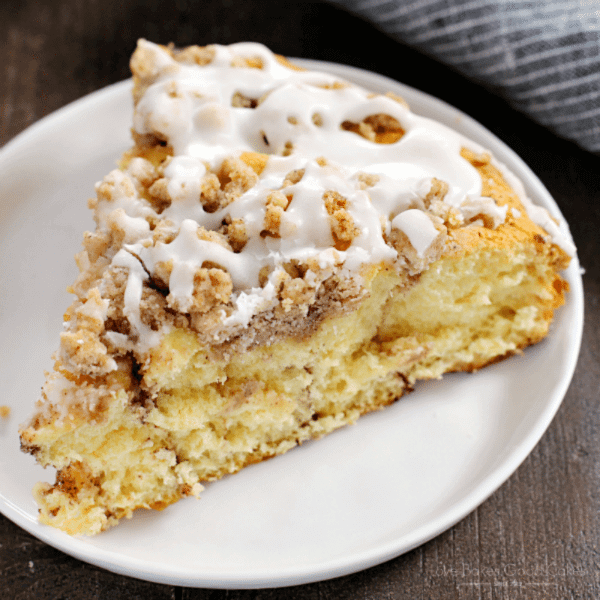 This Cinnamon Roll Crumb Cake starts with refrigerated cinnamon rolls – but you make it extra special with a homemade crumb topping! This recipe is perfect for Easter breakfast! We usually serve our Cinnamon Roll Crumb Cake with bacon (or sausage links), scrambled eggs, and fresh fruit. Although this is great for a holiday (Easter morning would be great! ), you don’t have to wait that long if you don’t want to! 😉 We occasionally enjoy this for a Sunday breakfast or when we have company over for the night or weekend. If you don’t already have one, you’ll need an 8-inch cake pan for this recipe. Any brand of refrigerated cinnamon rolls will work for this recipe – you’ll want a tube that is about 16-17.5 oz. My family loves this so much that I usually have to make two for our family of six …. so consider making two also if you have a large family or if people might want more than one serving! 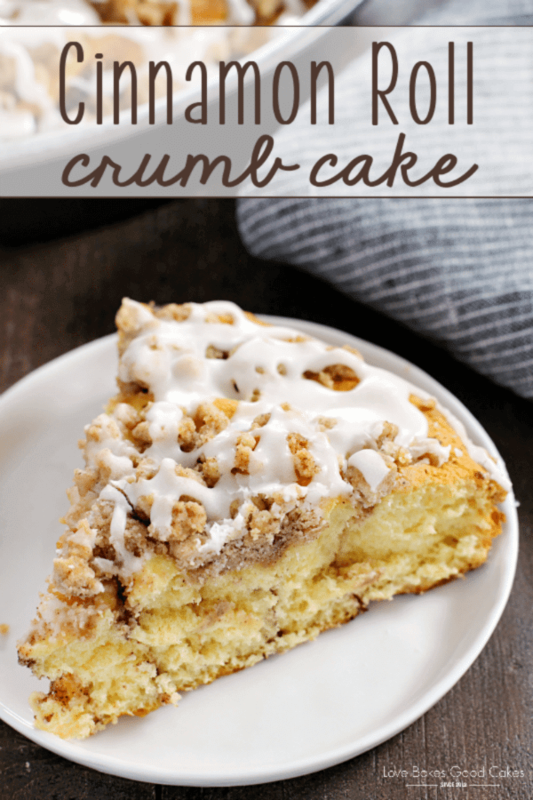 This recipe for Cinnamon Roll Crumb Cake is so easy peasy – and a family favorite! 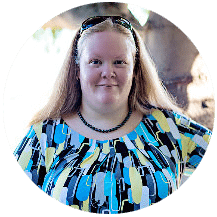 Get ready to receive your rock star status! You deserve it! 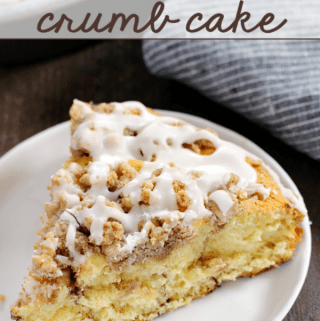 This Cinnamon Roll Crumb Cake starts with refrigerated cinnamon rolls - but you make it extra special with a homemade crumb topping! This recipe is perfect for Easter breakfast! Preheat oven to 350°F. Spray an 8-in. cake pan with cooking spray. Open the cinnamon roll tube, remove the frosting and set it aside. Separate the cinnamon rolls. Place one cinnamon roll in the center of the cake pan. Unroll another cinnamon roll completely and wrap it around the cinnamon roll in the pan. Repeat with the remaining cinnamon rolls. In a small bowl, combine the flour, brown sugar, cinnamon and melted butter with your hand until it resembles coarse crumbs. Sprinkle the mixture evenly over the top of the cinnamon rolls. Bake 25-28 minutes or until the cinnamon rolls are cooked completely, and the crumb topping is lightly browned. Transfer the frosting to a small zip-top bag and snip the corner. Drizzle the frosting evenly over the top of the cake. Serve warm. 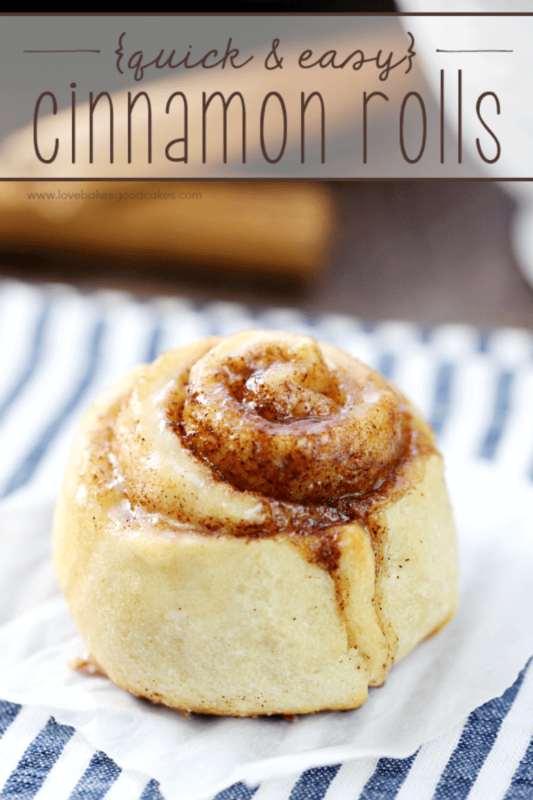 Love that this recipe is something a little bit different to do with tubed cinnamon rolls! I am looking forward to trying this soon! Ohhhh! Pinning so that I can make these for Saturday breakfast! Looks so yummy Jamie! Yum! Thanks so much Jamie, can't wait to try this! I love cinnamon rolls! I'll be trying this soon! I'm craving now a big slice of this cake! yowsa! this looks beyond good! That looks awesome! Love that it's a fancier version of normal cinnamon rolls 🙂 I really must try to find those things here in the UK! Oh wow! Yum! I love anything along the lines of a cinnamon roll! Looks phenomenal! 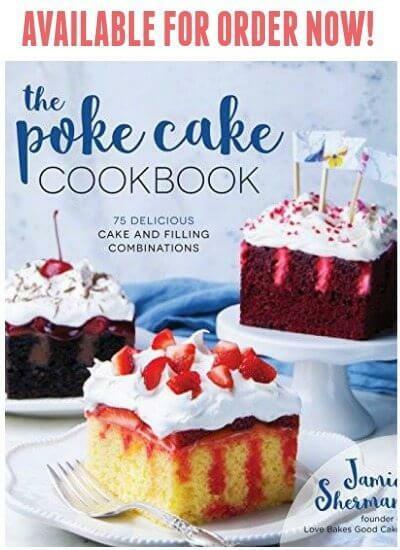 Oh my goodness Jamie this looks amazing! I love how it swirls in the pan, and then the crumb, wow! 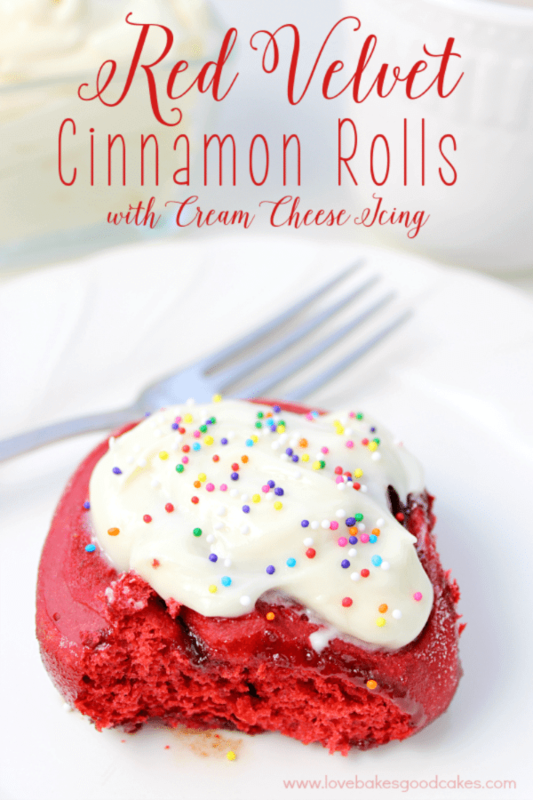 Pinned and checking this amazingness out from the inand out kitchen link party! These all looks delicious!! Wow, that cake looks so good. 😀 I love your photography as well. 🙂 I'm pinning this one; thanks for sharing! Easy and looks great! Pinned! omg yummy! I will be making this asap! Oh lawd I need to try this ASAP! Drooling 🙂 Thank again for linking up, Jamie. omgosh, I'm drooling…looks totally delicious! This looks AMAZING, Jamie! Drooling over here…I would absolutely love this with a cup of coffee in the morning! Cinnamon is my favourite spice, I adore this cake. This looks delicious. Thanks for linking to Sweet and Savoury Sunday! Stop by and link up again this weekend! That my friend….looks awesome! Pinning! It's noon and guess what I want for lunch? A salad? NO! 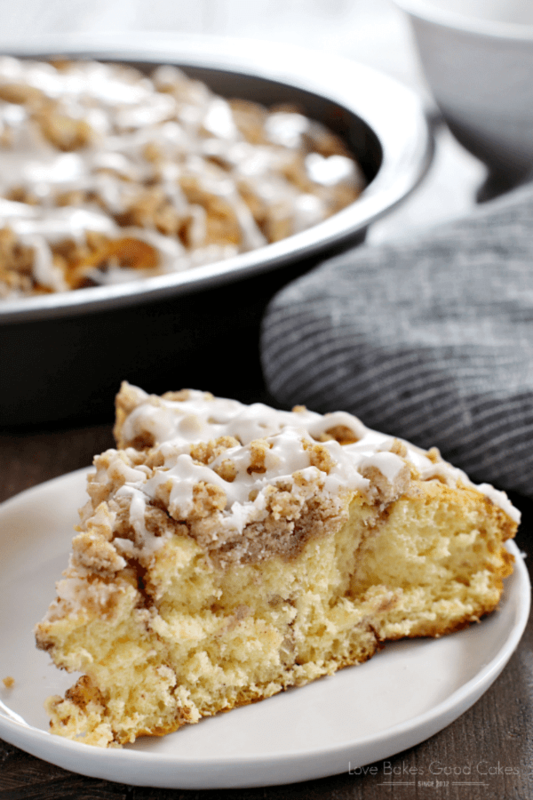 I want cinnamon roll crumb cake. Thanks for sharing at Inspire Us Thursday on Organized 31. That cinnamon roll cake looks scrumptious! Anything with cinnamon just instantly makes my stomach growl like crazy! 🙂 This looks sooooo good, Jamie! My kids would love this! And so easy! Hey Jamie! If I'm remembering right we talked ages ago (you're originally from Iowa right? )….anyway I'm an Iowa food blogger. I shared this recipe on my FB page last week and I can't stop thinking about it! I have a brunch meeting to go to tomorrow and guess what I'm making? Yum! I tried this recipe today and it is absolutely heavenly! A nice twist to just using regular cinnamon rolls. A keeper of a recipe for sure! I'm baking these right now. It was a little bit of a mess unrolling the rolls as the topping kept falling off. Added in an extra 1/2 tsp of cinnamon because I love cinnamon. I'll let you know how they turn out.